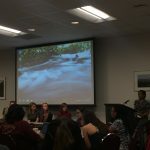 Johnson Talks about the importance of networking with Texas State Students. 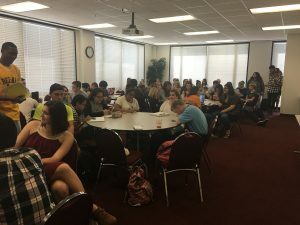 SAN MARCOS- Justin Johnson shared networking tips and experiences with students Thursday in the closing session of a successful Mass Comm Week at Texas State. 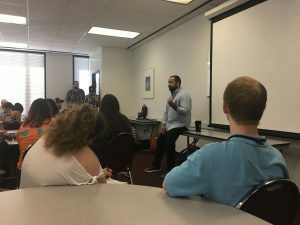 Johnson, a San Antonio native, works in professional services for Facebook in Austin and shared some of his experiences in college as well as networking knowledge with students that attended the session. During the session, Johnson explained how it is important to network with people, talk about skills and demonstrate how passionate one is to his/her ideals in order to awake people’s interest. “Some of the opportunities that I have had, it’s because of people,” said Johnson. Johnson gave advice to future graduates. Some of the advice was to take time for themselves, be open to new opportunities and to never stop introducing themselves, their skills and ideas. After his talk, students asked questions about the importance of networking and left the session with a new perception. Some other students found inspiration in the advice and experiences that Johnson shared with the group. Mary Edmon, a senior in the public relations major, said that an important lesson to be taken from this session was about networking. “I think the biggest take-away would be to not be afraid, to be approachable and approach other people, like he said ‘everybody is human’,” said Edmon. Students left the session with a new vision of networking, knowing about the importance of making connections with people and about following and being true to oneself.